Rabbit anti Human Interleukin-4 antibody recognizes human IL-4 (Interleukin-4), also known as B-cell stimulatory factor 1, a 129 amino acid pleiotropic cytokine which interacts with multiple cell lineages, including T cells, fibroblasts and haematopoietic cells, and is one of the most important factors involved in B cell IgG1 and IgE class switching. IL-4 signalling through the IL-4 receptor (IL-4R), under the influence of Stat6, induces the differentiation of CD4+ T cells into Th2 helper cells, which themselves then secrete IL-4 along with IL-5, IL-6, IL-10 and IL-13. Excessive secretion of IL-4 by Th2 helper cells has been linked with allergy and elevated IgE levels. Reconstitute with 0.1ml distilled water. For long term storage the addition of 0.09% sodium azide is recommended. NB: For functional studies do not add azide. Antisera to human IL-4 were raised by repeated immunisations of rabbits with highly purified antigen. Purified IgG prepared by affinity chromatography. 1 This product requires antigen retrieval using heat treatment prior to staining of paraffin sections. Sodium citrate buffer pH 6.0 is recommended for this purpose. 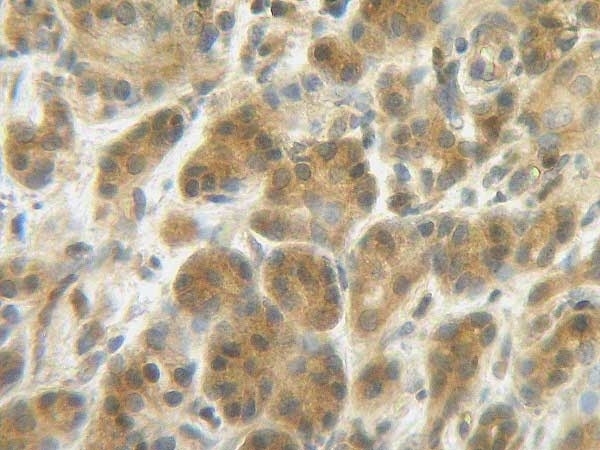 This purified human IL-4 antibody may be used in ELISA with recombinant human IL-4 (PHP234) as the standard. Arai, N. et al. (1989) Complete nucleotide sequence of the chromosomal gene for human IL-4 and its expression. J Immunol. 142 (1): 274-82. Steinke, J.W. & Borish, L. (2001) Th2 cytokines and asthma. Interleukin-4: its role in the pathogenesis of asthma, and targeting it for asthma treatment with interleukin-4 receptor antagonists. Respir Res. 2 (2): 66-70.